When writing my medieval characters in The Grotto's Secret, I had to clothe them of course. 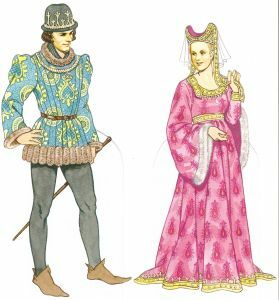 So I started researching what people in the middle ages would have worn. Even those the poor unsuspecting characters had no idea they would start a conspiracy in my suspense thriller The Grotto's Secret, I enjoyed finding clothes for them to wear. Almost as thought they were paper dolls and I had to give them different outfits to suit the occasion. Reminded me of my nieces playing Barbie Dolls! The History of Costume had most of what I needed to know. In 1450 the man wears a short pourpoint jacket lined with fur. His hat is trimmed with a gold coronet. The woman wears an escoffion with a veil and gold ribbon attached. Her brocade gown has fur-lined dalmation sleeves. Jewels and gold were often used to line clothing of the nobility as a means to display wealth. In this image below, the man wears a “shockingly” short tunic that became popular in this period. The feet of his hose are pointed and tipped by bells. Bells were often used on many garments, especially belts, purses, and shoes. The woman wears a gown with bag sleeves trimmed in fur. Her headdress is a more modern version of the toque, worn with a butterfly veil. But the big question is ~ is my medieval character male or female? And what type of clothes does this character prefer wearing? Don't you just LUV these medieval shoes! Find out more weird and wonderful things I did while writing my historical conspiracy thriller.